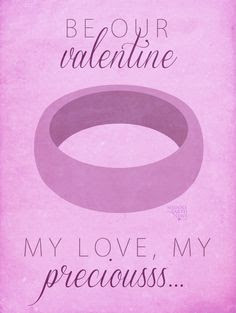 Christmas may be over, but there's one more major shopping holiday coming up -- you guessed it: Valentine's Day. Although not everyone is on board with the concept, it is a fun occasion to spoil yourself or a friend/spouse/significant other/etc. Like Christmas and birthdays, it's an opportunity for Tolkien collectors to give and receive something special. 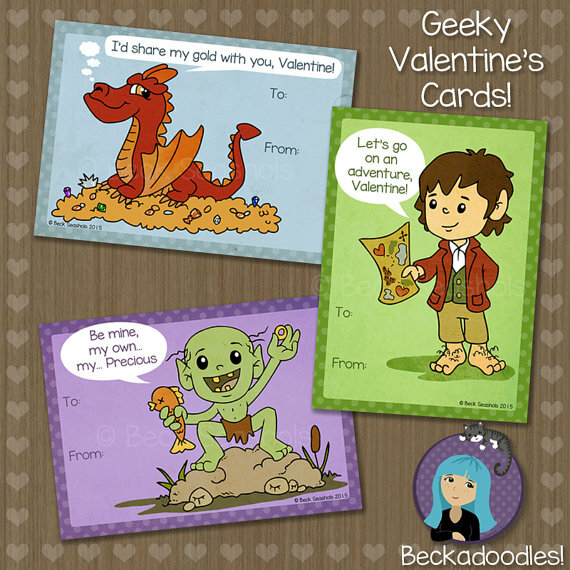 So regardless of how you feel about Valentine's Day, here are some gift-giving ideas for all types of recipients, whether you want to give an extravagant gift, something small, or a card with a message from the heart. Cards are great for friends, family, and new relationships where you want to express your feelings but aren't sure what kind of gift to give. Beckadoodles has some fun Hobbit Valentines on her Etsy shop; while you're there, take a look through Etsy, as there are lots of creative designs available this time of year! His and hers Nenya rings from Badali Jewelry - Get your officially licensed, book-inspired Elven rings of Power from Badali Jewelry! These rings are available in sterling silver, white gold, yellow gold, rose gold, and palladium white gold and with several different stone options. Prices range from $177 to $3,716. 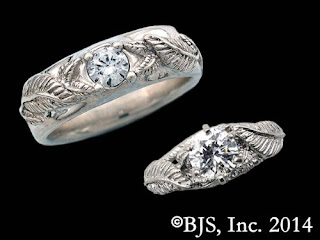 This set is as versatile as you want to make it and can be used as a promise, engagement, or wedding ring set. 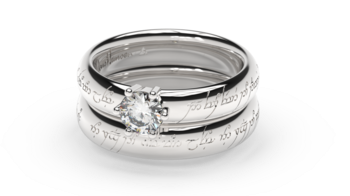 Elvish inspired engagement rings from Jens Hansen - Made by the same folks who crafted the original One Ring for Peter Jackson's Hobbit and Lord of the Rings films. Custom engraving available on inside and out. Ring is available in white gold, platinum, palladium, red gold, and yellow gold and ranging in price from $629 to $2,859. Elvish inspired wedding rings from Jens Hansen - Made by the same folks who crafted the original One Ring for Peter Jackson's Hobbit and Lord of the Rings films. Custom engraving available on inside and out. Ring is available in red gold ($3,589), yellow gold ($3,589), white gold/palladium/platinum ($4,219). The Tale of Beren and Luthien (pre-order) - Perhaps the greatest love story ever told. While you won't be able to read this book until its release on May 4th, you can at least pre-order it. Tolkien's Requiem: Concerning Beren and Luthien - you can download this title for Kindle and read up on the story of Beren and Luthien while you wait for the aforementioned book's release. Cooking for Halflings and Monsters - Why not treat your Valentine to a nice, home-cooked meal using one of the recipes in Astrid Winegar's new book? Or maybe you'd have more fun cooking some delicious meals and treats together? The Proverbs of Middle-earth - This is a fun read featuring many of the proverbs found in Tolkien's writings, through which we learn a lot about each culture and race in Middle-earth. When in doubt, some good places to browse are Etsy for handmade/unique items, eBay for harder to find items and good deals, and AbeBooks for a wide variety of Tolkien books at great prices. 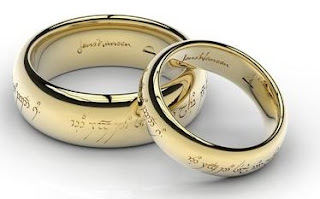 While places like HobbitShop and The Noble Collection do offer a wide range of merchandise and collectibles, when it comes to expensive items like jewellery, my personal recommendations are Badali Jewelry, Christie's Jewellery in NZ, and Jens Hansen jewellers. You will pay more money in some cases, but the quality of these three companies is far superior and definitely worth every penny. Have some ideas of your own you'd like to share? Feel free to leave a comment below, Tweet me, or leave a comment on my Facebook page!